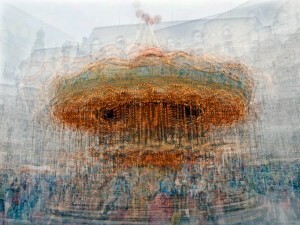 work creates new visual experiences by deconstructing and reconstructing photographic images. The images are tinged with color, a trace of movement and atmosphere of different surrounding neighborhoods. Dozens of photos create an abstraction of places we’ve never been and we’ve never seen. As Pep said ‘Part memory, part imagination, not like the way we see’. 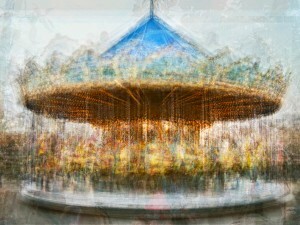 In this series, multiple shots of carousels were taken while walking in a levitra side effects circle around it, then overlay together and reworked to discover mysterious movement of carousels. One snapshot can capture only one specific moment in time while this reconstructed collage gives a depth to flat photography. 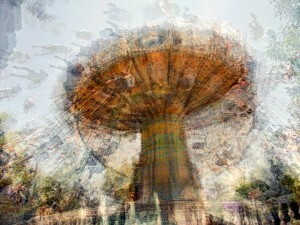 People can feel a collage of time and memory from it.